Republicans retained their congressional majorities after the 1996 election, and President Bill Clinton won re-election. The 105th Congress (1997–1999) began with a bipartisan budget agreement and tax cut. But after an Independent Counsel’s report revealed inconsistencies in statements President Clinton made under oath, the House adopted two articles of impeachment against him in a rare lame-duck session following the 1998 elections. 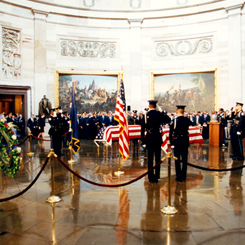 Two Capitol Police officers, Officer Jacob J. Chestnut, Jr., and Detective John M. Gibson, died in the line of duty in 1998. 1Resigned on December 21, 1998. See, Roll Call, "House Clerk's Office Shake-Up Continues," (January 7, 1999): 1, 21. 2Appointed by the Speaker effective January 1, 1999. See, "Appointment by the Speaker After Sine Die Adjournment," Congressional Record, 106th Cong., 1st sess., (January 6, 1999): H228. 3Appointed January 9, 1997, "to act as and to exercise temporarily" the CAO duties. See the Congressional Record, 105th Cong., 1st sess. (January 9, 1997): 76. Resigned July 1997. 4Elected by H. Res. 207, on July 31, 1997. See, Congressional Record, 105th Cong., 1st sess., (July 31, 1997): 6669.